This type of level switch uses the principles of buoyancy and magnetism to detect the presence or absence of a liquid contained within some type of a vessel, which could be a tank, bin, trough, standpipe, etc.. The magnetic float level switch name is very descriptive. This level switch consists of a float with an internal magnetic element that will be buoyant and ride up or down on its stem as the fluid in the vessel which the level switch is installed in goes up and down. The float is made specifically to work with fluid specific gravity (density) of some minimum value, which is determined by the float size (volume) and weight. The stem or tube is hollow and contains a reed switch element placed at a user defined position in the stem as it relates to a specified distance from either the process connection of the level switch or the bottom of the stem. The travel of the magnetic float is contained above and below the float by retaining clips. The reed switch responds to the presence of the magnet within the float as it passes by the reed switch located inside the stem, traveling up or down with the liquid level. Information regarding the Aplus Finetek magnetic float level switch, the FG Series, can be found within our website. The magnetic float level switch is also a great fit where multiple switch points exist, such as high-high, high, low and low-low. In this case there are four level points requiring a contact output for various purposes of control and alarm. These level switches can be equipped with one, two, three and even four separate and distinct level switch points on a single stem, meaning four switch points with only one process connection! A wide range of materials of construction can be provided, including stainless steel and anti-corrosive polymer materials. They can be provided suitable for explosionproof hazardous vapor or dust environments as well. The usual applications to avoid, other than when they do not fit the operating environment like temperature, pressure, mounting orientation etc., is when the fluid is contaminated or contains metallic parts and debris. These particles can interfere with the magnetic activation of the reed switches or cause failure of the device. 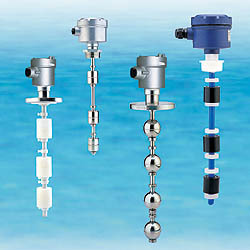 Use the magnetic float level switch with relatively clean fluids only, without high viscosity where the fluid is sticky. While utilizing the same operation principle as the standard size top mounting magnetic float level switches discussed above, these devices are also available for side mounting and are also found in very compact or mini size. The principle of operation of the magnetic float level switch is simple to implement, very reliable and cost effective. The magnetic float level switch is a reliable and rugged cost effective level switch. Aplus Finetek offers the FC/FD series magnetic float level switch. For more information on the FC/FD series magnetic float level switch go to the FC/FD Series magnetic float level switch product page or contact us at 815-632-3132.